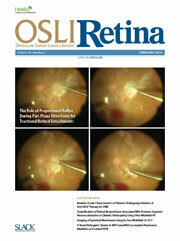 OSLI Retina focuses exclusively on retinal diseases, surgery and pharmacotherapy. OSLI Retina will offer an expedited submission to publication effort of peer-reviewed clinical science and case report articles. The front of the journal offers practical clinical and practice management features and columns specific to retina specialists. In sum, readers will find important peer-reviewed retina articles and the latest findings in techniques and science, as well as informative business and practice management features in one journal.